Event featured dozens of employers, colleges, and healthcare services who met with the hundreds of veterans expected to attend; Job Fair included veterans who participated in Military Career Workshop with Johnson & Johnson six days earlier. New Jersey Department of Labor played critical role in encouraging veterans to attend this event. Over 500 military veterans and their families met with the over 70 employers and organizations on hand at the sixth Annual Newark Veterans Job Fair on March 21st at Rutgers-Newark’s Paul Robeson Campus Center. The event was hosted by the GI Go Fund, in partnership with Mayor Luis Quintana, the City of Newark, the Department of Labor One-Stop Career Center, Soldier On, AXA Equitable, and Rutgers-Newark. 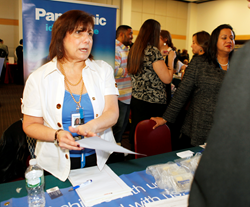 There were 72 businesses and organizations participating in this event, including Johnson & Johnson, PSEG, Panasonic North America, Wells Fargo, Coca-Cola, New Jersey State Police, and the FBI. Each company will be looking to capitalize on the Returning Heroes and Wounded Warrior Tax Credits, which will provide a tax credit of up to $9,600 to employers who hire veterans. Countless veterans participating in this job fair received assistance with their resumes and job interview skills, as they already had attended the Military Career Workshop at the Johnson & Johnson headquarters in New Brunswick the Saturday prior to the Job Fair. Among the mentors who spoke with the veterans was Alex Gorsky, CEO of Johnson & Johnson and a retired Army Ranger Captain. This two-pronged approach helps veterans hone their skills and prepare their resumes in time to meet with the bevy of employers they will see at the Job Fair. The event at Rutgers-Newark will also include dozens of colleges and universities looking to enroll veterans who wish to utilize their Post 9/11 GI Bill benefits to earn their degree, or use their VRAP benefits to receive retraining benefits for 21st century employment positions. Among the universities in who will be in attendance are Rutgers University, Essex County College, Princeton University, and Drexel University. Many of the veterans on hand for the event were encouraged to participate at the job fair by the NJ Department of Labor and the DOL One Stop Career Center in Newark. The agency worked hard to notify and recruit veterans to attend, and their efforts served as a critical role in matching the many unemployed veterans in need of work with the companies looking to hire them. Recent unemployment reports from the Bureau of Labor Statistics show that Post 9/11 era veterans are currently suffering from an unemployment rate of 9.2%, almost three points higher than it was just a month before. The event was hosted by the GI Go Fund, a leader in the region in providing cutting edge services to veterans and their families. They have linked thousands of veterans to various employment opportunities, and have helped give them the tools they need to succeed in the job market. They have also assisted countless veterans with going to school and obtaining the health benefits they have earned. This year, the organization is working on expanding health care services to veterans who lack access to VA health care facilities. Sponsors and partners for the event included PSEG, Soldier On, City of Newark, the Newark One Stop Career Center, AXA Equitable, and Rutgers-Newark.